Rodman was formed from Adams, March 24, 1804, under the name of Harrison, in honor of one of its proprietors. Its present name, Rodman, which was received April 6, 1808, was derived from Daniel Rodman, popular clerk of the Assembly, 1808-1809.Rodman is nearly square; measures little more than six miles in length and contains 22,597 acres. It is bounded on the north by Watertown, on the east by Lewis County, on the south by Lorraine and Worth, and on the west by Adams. In 1810 there were 214 families and 1,281 people. There were four grain mills, six sawmills, one fulling mill, a carding machine, and three distilleries. There were no houses of worship, but meetings were held in four school houses. 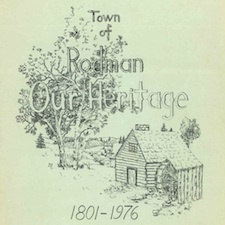 Town of Rodman: Our Heritage history book.